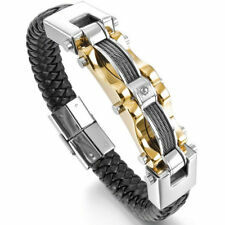 Item: Gold Plated Skull Luxury Bracelet with strong magnetic clasp and genuine leather rope chain. Stylish, high quality, and perfect for casual wear. The two golden skull beads move freely on the bracelet. 12ct lab diamonds. 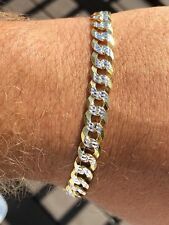 Real 14k Yellow gold electroplated over SOLID 925 Sterling silver. Bracelet & Chain Sets. 925 Silver Jewelry. Will never turn your hand green or tarnish. Not plated or filled.this is SOLID silver underneath. L2JK HIP HOP JEWELRY. THIS BRACELET IS GOLD PLATED OVER HIGH QUALITY ALLOY. Bracelet Specifications. Stone Color - Clear Cubic Zirconia. We will do our best to resolve your issue. Bracelet Details. Stainless Steel. Color: Gold.